Hello! 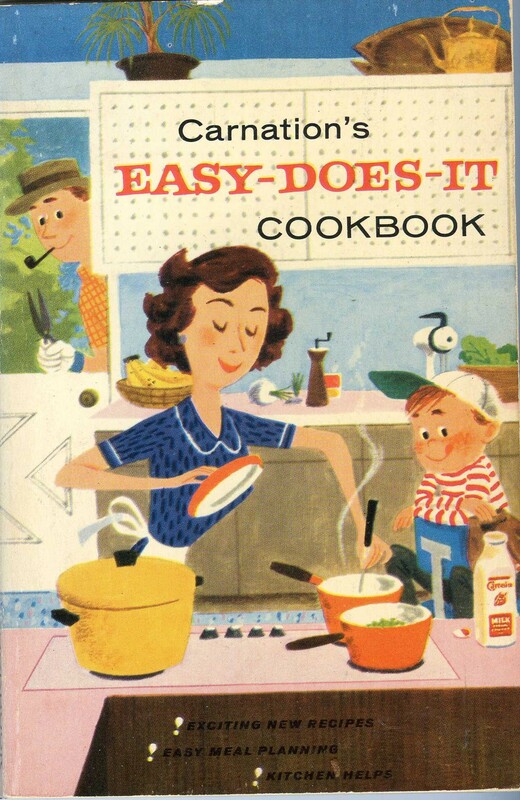 Welcome to the Mid-Century Menu, the feature on my blog in which I pick an unusual, interesting or strange recipe from my vintage cookbook collection, cook it, and then serve it to my husband for dinner! Poor Tom, the human guinea pig. This week’s pick for dinner comes from the cookbookwith the best cover so far, the Carnation Easy-Does-It Cookbook. I love this cookbook. It is really friendly in tone, it has a ton of great trivia and helpful hints, and look at those illustrations! What a sweet pink and blue kitchen. You can even see the Sunbeam mixer on the counter in the background of the picture. Ahh…perfect. Hmmm…I wonder if I could get that blouse somewhere? Or those chairs…or that floor! And I have two words for you: pink cooktop. The back of the cookbook is just as cute. This cookbook is dedicated mostly to all the Carnation products on the market at the time, specifically; homogenized milk (which is a big deal in the book, so it must have been new at the time), sour cream, buttermilk, cottage cheese and so on. I happened to pick a recipe that uses no dairy products, but some of the ones that do in this book are great fun. Lookfor them in upcoming posts along with some of the great illustrations from the book. This time around I decided to go with something that sounded tropical, since as you are reading this very sentence, Hubs and I are on a plane to Aruba! Thank goodness for vacation. 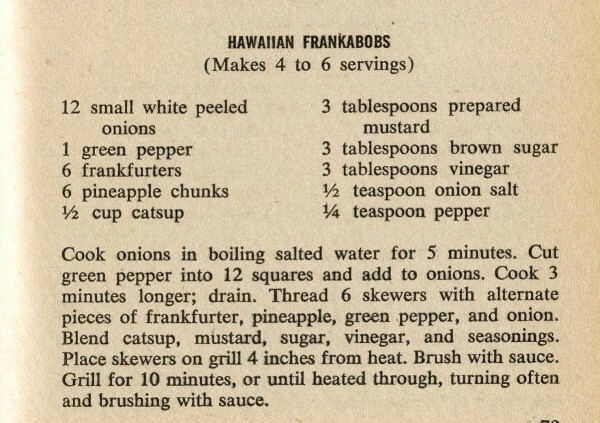 So, to get us geared up for vacation, I picked the recipe in the Carnation book that sounded the most exotic. I am excited! Off we go! 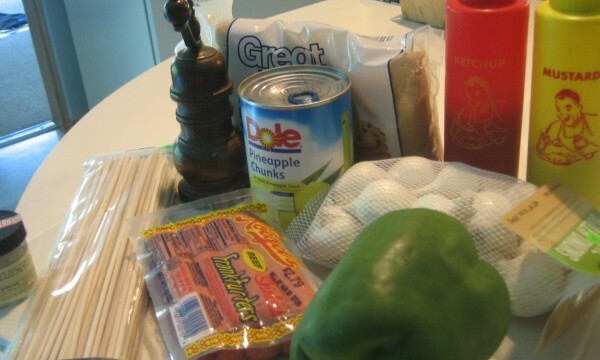 The assembly of the various ingredients. 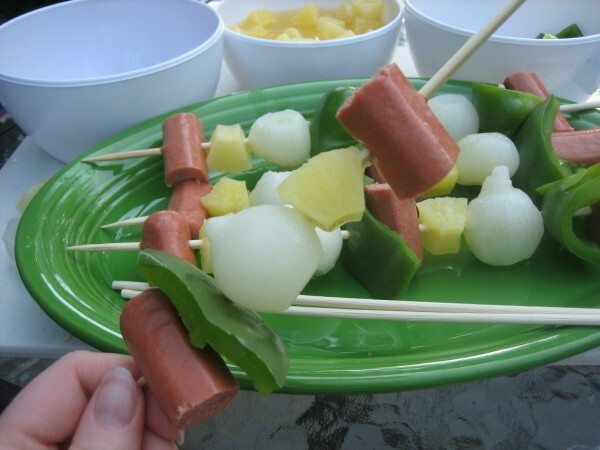 What is with the combination of green pepper and pineapple? I see that all the time in vintage recipes. 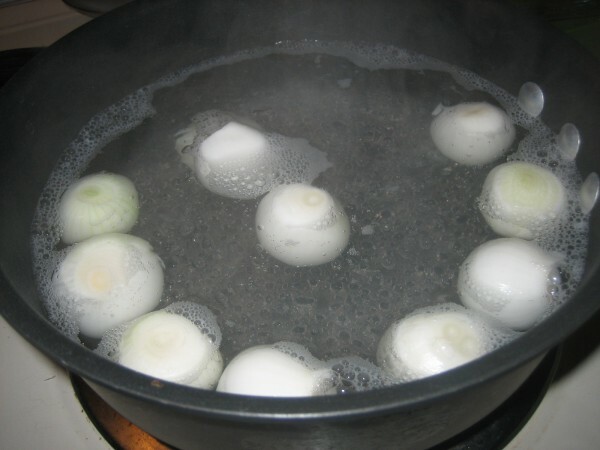 The happy little peeled onions, boiling and bobbing away. Do you know what a pain it is to peel 12 little onions?!? Uh. 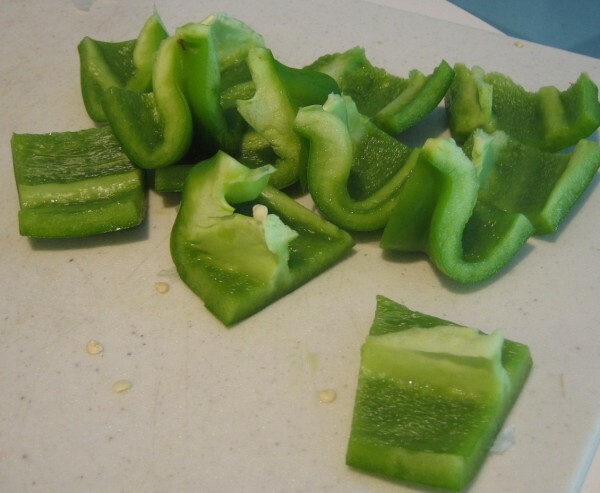 The green pepper cut into precisly 12 pieces. Yup. Exactly 12. No leftovers. None. Together at last! 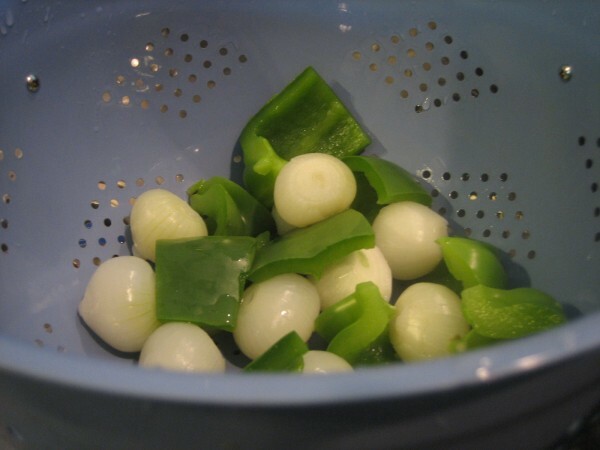 The cooked onions and green peppers. The ingredients for the sauce, ready to be mixed. It reminded me of BBQ sauce ingredients. Intriguing. 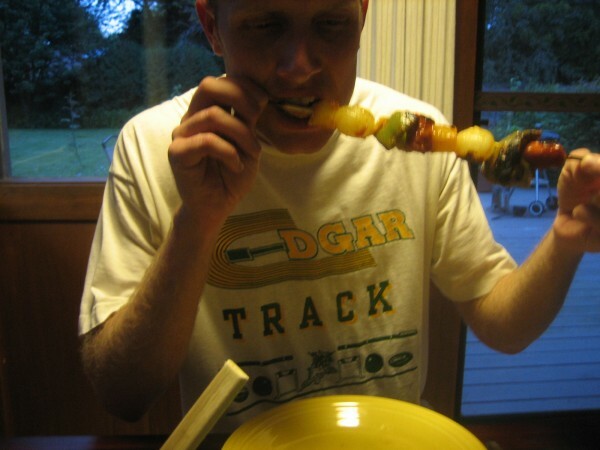 By the way, it is kinda hard to get pineapple chunks on a skewer. Those little suckers are slippery! The assembled frankabobs, ready for the grill! 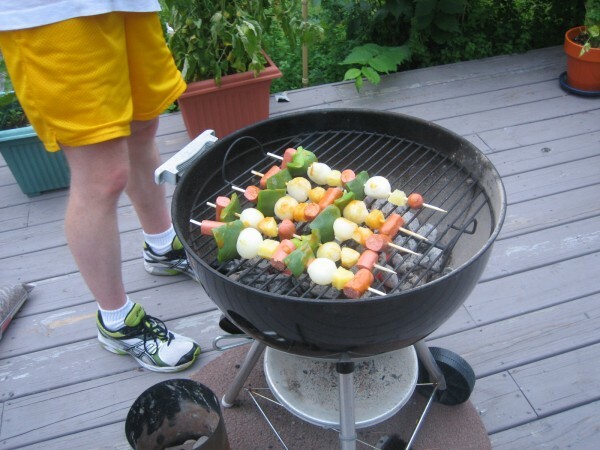 Tom grilling the frankabobs for me. It is kind of funny, isn’t it? Making him grill the dinner that may or may not be terrible. Me, adding some sauce to the frankabobs. After I was finished with this, I turned around to find Tom with his finger in his mouth and his face all twisted up, like he was in pain. Fresh frankabobs. Can’t get any better than this…I guess…. Tom, taking the first bite. The Verdict: Tasted like hot dogs. This meal wasn’t too bad. 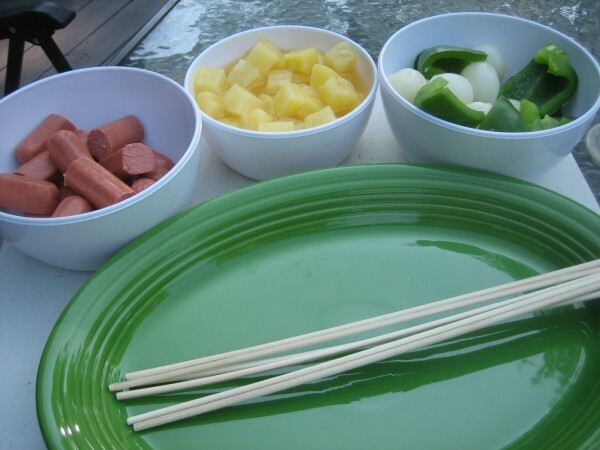 The sauce had far too much mustard or vinegar in it, and it really didn’t go very well with the green pepper or the pineapple. The onions were cooked for way too long and had become mushy to the extreme. 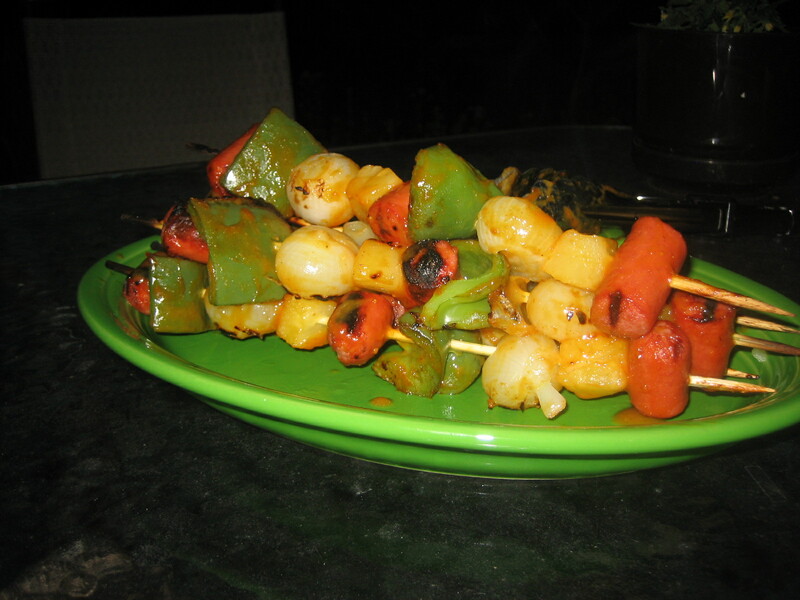 A lot of them fell off the sticks onto the grill, and the others fell off in transit from platter to plate. Tom picked his up at the end and pushed them into a little pile on his plate. 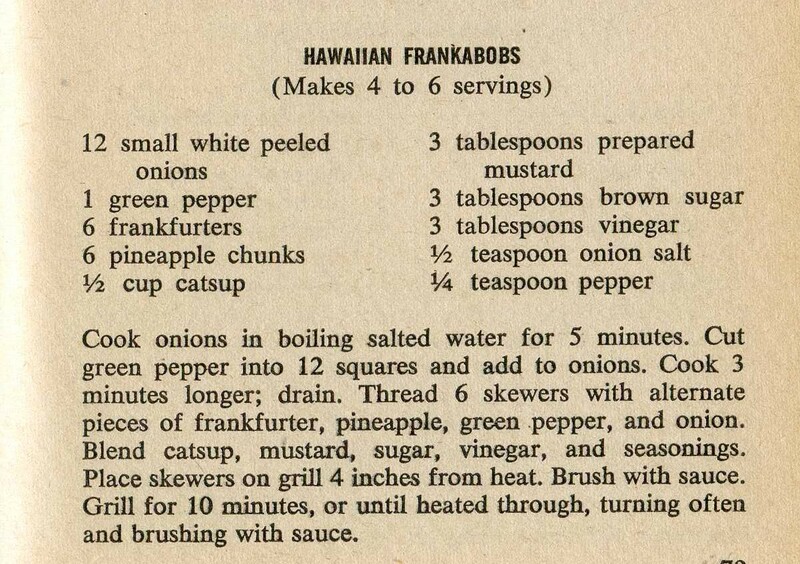 If anyone tries this at home, reduce the pre-cooking time for the onions by about half. 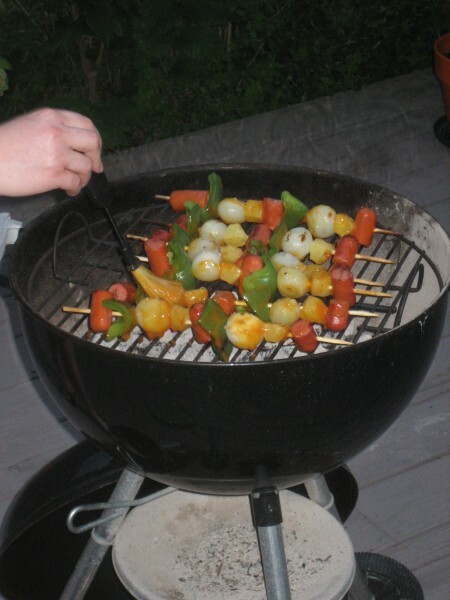 Otherwise, it basically just tasted like grilled hot dogs. Not bad, just not the exotic flavor I was expecting. But Tom didn’t mind, and when I asked him for more feedback, he was too busy eating the rest of the frankabobs to respond. He ate everything straight off the sticks. Except for the pile of onions. Too Funny! I think my mom might have made these at some point back in the 60’s. 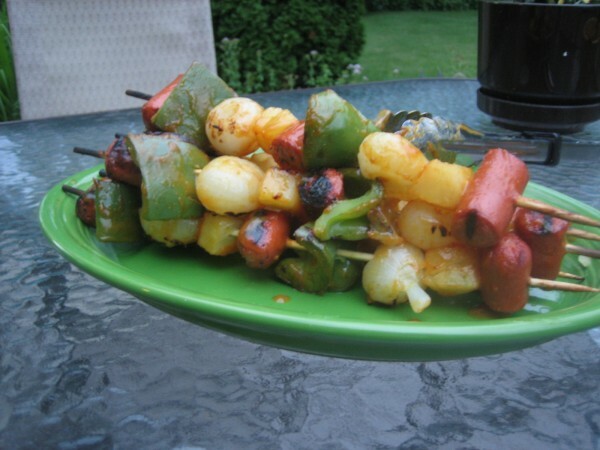 There was a recipe WBW (way back when) on the label of a Karo Syrup bottle that my mom made all the time – Hawaiian Chicken – which had the obligatory pineapple/onion/green pepper. Thank goodness they left out the BBQ sauce on that one! Hey, this looks pretty good! 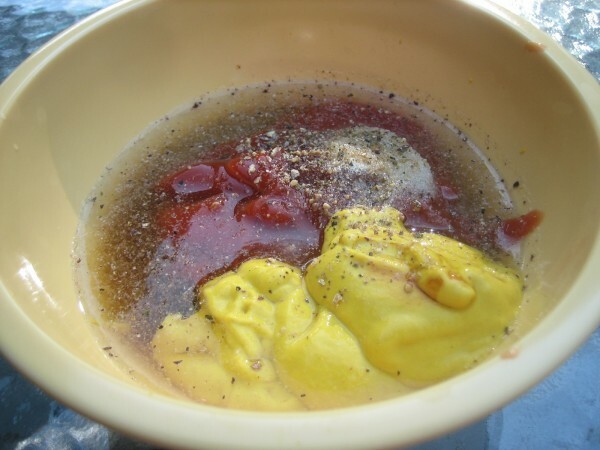 But I agree, there’s way too much mustard and vinegar in the BBQ sauce, according to the recipe. Ruth, you do such a nice job at the prepping! Everything is so picture perfect! You should be on the Food Network! Your cooking entries remind me of an old show from the Style Network. 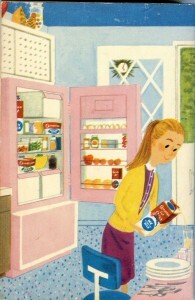 Does anyone remember Brini Maxwell? Bologna Sacks! 🙂 Frankabobs is pretty cool to say too! Hmmmmm, do I see a theme using Hot Dogs A LOT in cooking back in the 50s/60s? 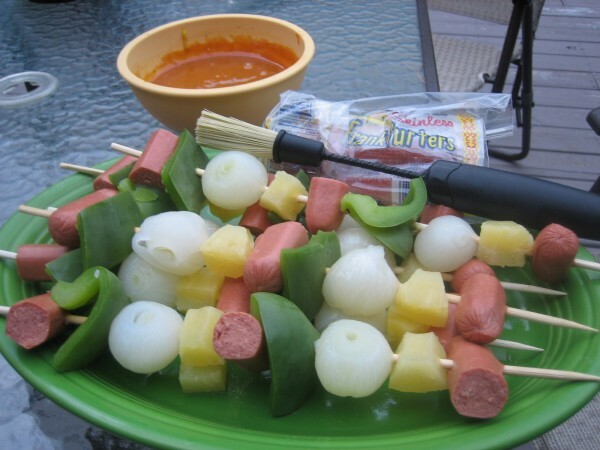 It seems like they LOVED Hot Dogs back in the day! Glad you kind of (?) liked this weeks meal. We won’t tell anyone about the green peppers, will we Sable. And, that pink fridge would look FAB in your kitchen. Have a AWESOME trip! PS – Sable – Did you miss my Pink Mixer yesterday? Sara, read my comments about your Sunbeam gem! I was gone yesterday and didn’t see it until now. Nope, Ruth, your secret is safe with us! When are you leaving, Ruth? Yes, have a wonderful time in Aruba (makes me wanna sing the Beach Boys Kokomo song)!